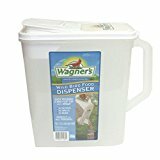 Wagner’s Wild Bird Food Dispenser is the perfect container to store your Wagner’s Wild Bird Food. It helps keeps Wild Bird Food dry and away from pesky critters. Perfect for pouring food into your favorite feeders. Trust your backyard birds to the experts at Wagner’s. This entry was posted in Birds and tagged 41580, Bird, Dispenser, Food, Wagner's, Wild by One Boutique. Bookmark the permalink.